Did the moon's tidal effect sink the Titanic? The 'once-in-many-lifetimes' event brought together the Moon's closest approach to the Earth for 1,400 years, a near encounter between the Earth and the Sun, and a spring tide. All these factors contributed to abnormally high sea levels which helped dislodge grounded icebergs and send them into the shipping lanes of the North Atlantic, [...] . Did the moon's tidal effect sick the Titanic? Not directly, but there was an unusual tidal event in the preceding months that may have contributed to the unusual number of icebergs in the shipping lanes in Spring 1912. Olson and others wrote an article detailing this theory that was published as the lead feature in the April 2012 issue of Sky & Telescope, a non-peer-reviewed but well-respected magazine. Essentially the article makes the case that an unusual combination of forces would have led to particularly high tides and that these incrementally higher tides may have floated some icebergs that otherwise have stayed grounded and perhaps, but for this, Leo and Kate would have lived happily ever after. I imagine that the only way one could prove this theory would be to examine the iceberg in question and see if it had signs of having been shallowly grounded. I have the article in question and could answer specific questions. I believe that Sky & Telescope makes their back-issues available for purchase on iOS devices. 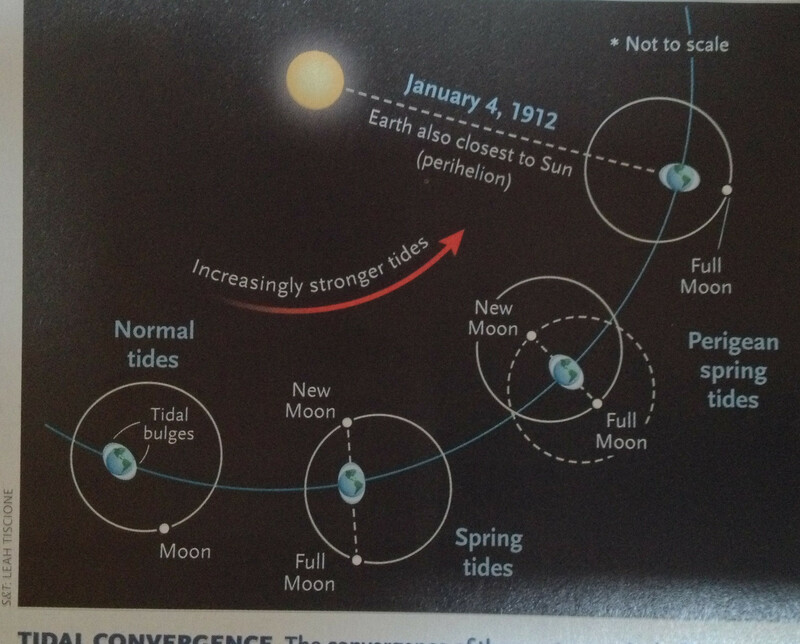 This illustration, taken from the article, shows the tidal forces: a combination of spring tides (when the Moon, Earth, and Sun are aligned), perigean ides (when the Moon is nearest Earth in its elliptical orbit), and perihelion (when the Earth is closest to the Sun). Not the answer you're looking for? Browse other questions tagged moon oceanography titanic . Was a mirage involved in the Titanic's sinking? What is the reason that the moon appears larger on the horizon? Do people with mental illnesses feel the effect more during the full moon? Is the ninth wave the largest? Was SS Californian intended to be a rescue vehicle for the passengers of a deliberately-sunk Titanic? Does the 'super-moon' have a measurable effect on probability and magnitude of earthquakes? Did NASA have a simulator to practice the moon landings? Did passengers of the Titanic predict/foreshadow its sinking? Did US flags on the moon turn white? Is there a 2.5 mile diameter object crawling along the Pacific floor?